How do you get the latest information on your competition? How do you check out the credentials of a potential business partner? How do you check out your political opponent's family values? How do you research a potential major donor for your favorite charity? How do you quickly and carefully get background information on the caregiver you are hiring to take care of your family? Deadline Online designs customized programs and workshops for businesses, government officials, journalists and researchers. Learn where to go online to find exactly what you need fast. Award-winning journalist and author Alan M. Schlein's fast- paced, in-depth training seminars will make you into a cyberspace super sleuth. 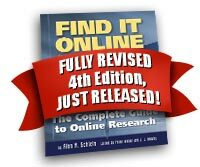 DEADLINE ONLINE'S website offers instant access to the best research and professional sources available, from the author of the acclaimed new book Find It Online.